The bold bit will need to be replaced with the real URL for wherever the site will be used. I’m taking part in a digital democracy panel discussion, hosted by the Commission on Strengthening Local Democracy. Emergent ICT strategies for local democracy: capturing innovation: updating the survey of CC websites we did in 2012. What has changed? What are the patterns? What are the reasons underlying the patterns? With thanks to Leaflet.js forum members Matt and Simon. I then selected each simplified LA in turn and saved them as geoJSON files. The resulting files are about a twentieth of the size of the unsimplified files. Yet zooming right in shows an acceptable (to me) fit to the unsimplified boundaries and coastlines. Yeehah. So after ac couple of days of literature reviewing, and spending Saturday being social, I was back at the code-face today. Entering single-initial letter postcodes such as EH3 7PX works – the map zooms to the right place. 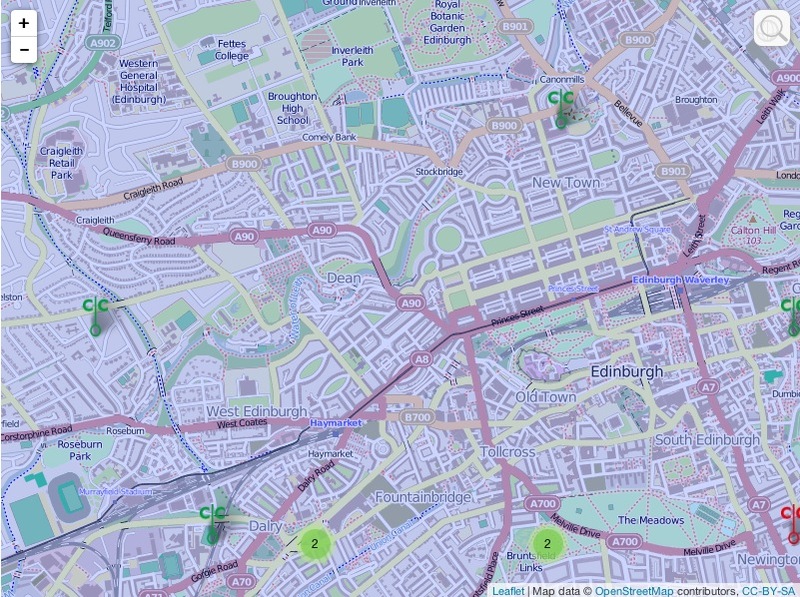 Entering textual places such as Merchiston, Leith Links, Macmerry and Dalry also works. But EH10 5DT still appears to be in Walthamstow, instead of Merchiston. EH12 6AP appears to be slightly east of Walthamstow, instead of near Murrayfield. I noticed that EH10 5DT and E10 5DT both give the same place (in east London), as do EH12 6AP and E12 6AP. So Nominatim is omitting the H in some cases. Interestingly, the geocoder works with Macmerry’s postcode (EH33 1PL). 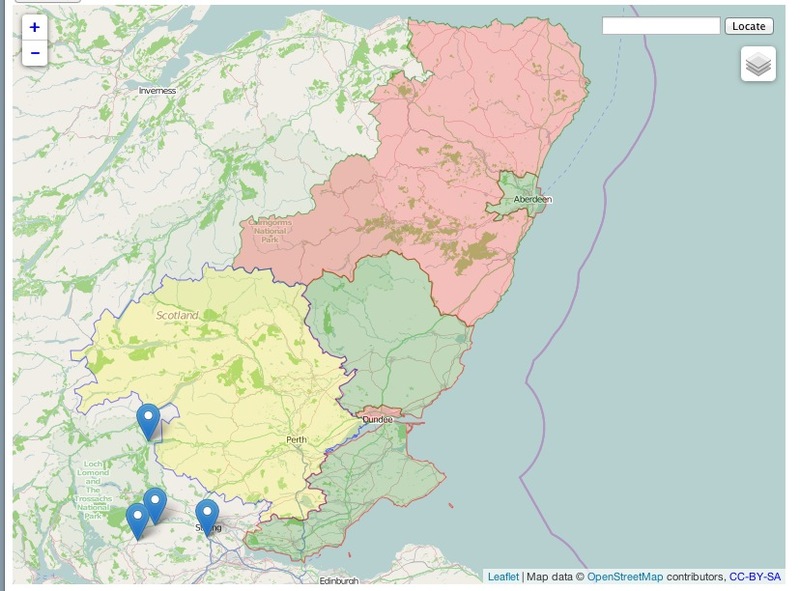 I worked my way through http://leafletjs.com/examples/geojson.html. I got most of it to work, except for styling the output. I then got a trial LA boundary to work – this trial had 4 co-ordinates. If it will work for four, it will work for many, many more – but will take longer. It took a while to work out the correct CRS option. I was surprised it wasn’t WGS84/PseudoMercator/EPSG3857 because that appears to be Leaflet’s default CRD. Then again, what do I know about converting points on am irregular 3D surface to points on a flat plane? Anyway, that gave me 32 nice geoJSON files in a little less than 2 hours. Using my stripped-down version of the code, I added in 32 routines to display the LA boundaries. They were still in the default blue – remember I’d not cracked styling them. There may be an advantage to separate routines and data files. If an LA ever changes, I’d just need to make new geoJSON files for that LA and its neighbours, and each can be coloured (if this ever works!) separately. Anyway, by adding var = <LA_name> [ to the beginning of each file and ]; to the end of each, then appropriately commenting off all routines except for the LA I was testing, I made sure each displayed OK. 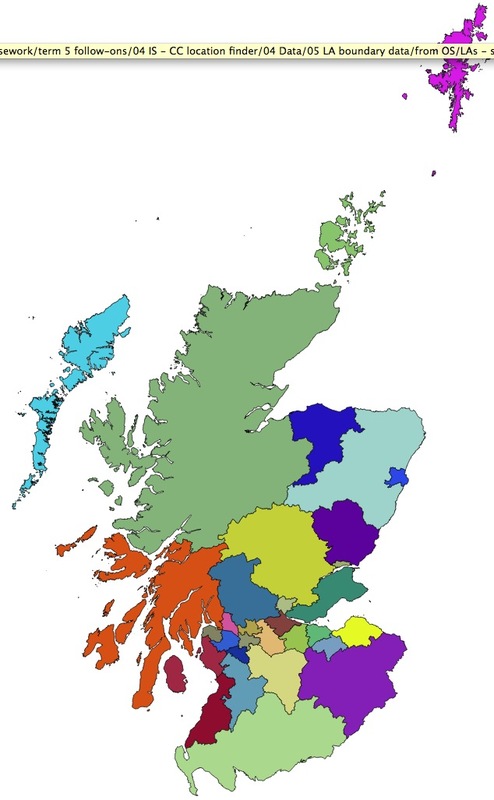 It almost worked straight off – all the LAs apart from Shetland and Scottish Borders displayed as they should. 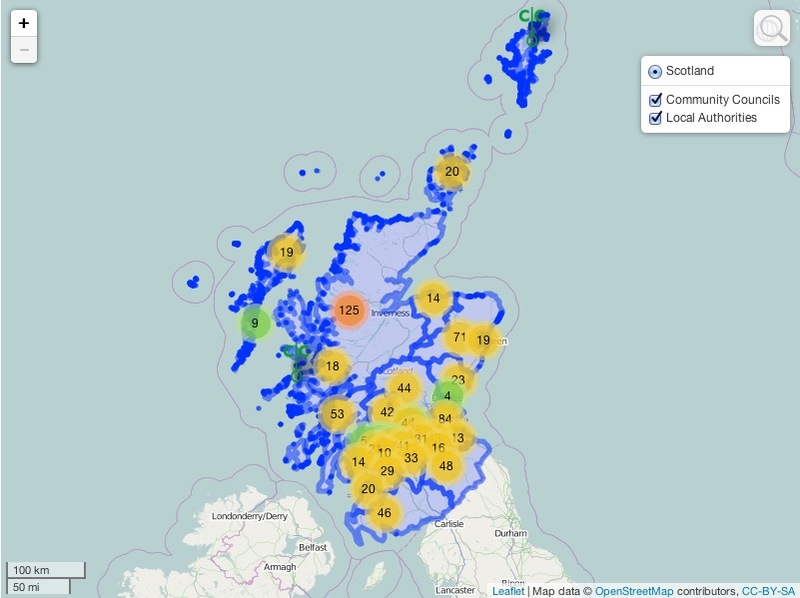 Shetland and Scottish Borders had some weird horizontal lines, but removing them from the huge file, then replacing their code from their individual geoJSON files got rid of these nasty artefacts. I guess I had pasted the code in slightly the wrong place first time round. Then the code for displaying the LAs is just a simple traversal of the array of LA boundary data. And all this without going anywhere near the command line. I’d thought this would be easy – just replace the code lumps for calculating the map centre, its bounds and displaying the CCs. Not a bit of it! Failure points included not calling the data, scripts and even the css in the right order, the functions for calculating centres and bounds not being called properly – aarrgh. Anyway after a couple of hours, it’s all there. It’s slow (I guess need to simplify the LA shapes before writing them to geoJSON format), the geocoder is still a mystery but it works. Yeehah! My reward for all that – 2 more hours doing stuff to a real CC’s website! So I’ve given up on the polygons for now. In fact, I’ve received some advice in response to an online plea for LatLong shape files for Scottish LAs but I won’t be able to look into this until Tuesday afternoon. So today on with the show of drawing a map with markers for all CCs for which I have LatLong data. This should have been easy – I’d had something very like this working for 2 CCs already, with different coloured markers for whether the CC had both website and email address, just an email address, no electronic contact details or no actual functionality. I started by knocking up some css and a disclaimer/copyright page and some custom markers for functional and non-functional CCs – easy, if not the prettiest thing ever. Then I followed the recipe for displaying a couple of LAs’ CCs (without differentiating between functional and non-functional), with the markers for each LA coalescing when zooming out from the map. 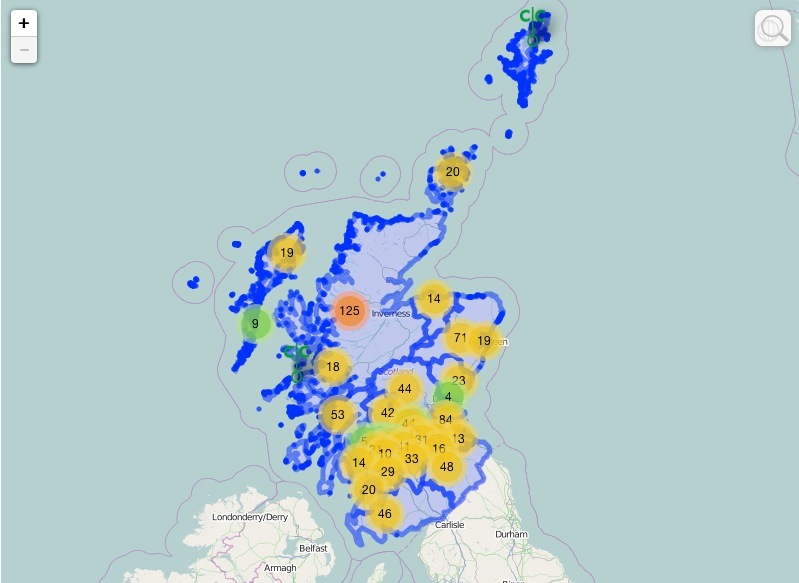 All fine, until I noticed the numbers in the coalescences were not correct – there should have been 19 CCs in Aberdeen and 71 in Aberdeenshire, but while Aberdeen was correct, Aberdeenshire had 90 CCs, so the markers for Aberdeen were presumable adding to the Aberdeenshire set. I then added in Angus CCs, and got even more confusing numbers. I battled with this for several hours, even stripping the code right down to for each CC in the whole dataset, document.write(“rude word”); No joy. So this is where my personal life affects my work life – I went to my regular sunday evening spin class. I started again about 8:30 and within 30 minutes, I had it properly working numbers for 3 CCs. 29 fairly tedious additions to a case statement and checks that the right numbers appeared, all 32 LAs’ CCs were appearing correctly. A quick hack to one LA got me green marked for functional CCs and red marked for non-functional ones, with each LAs’ own CCs coalescing into one lump no matter what colour they were. Then half an hour’s web-trawling got each LA’s CCs’ markers displaying popups linking to the relevant LA web pages. Job done! 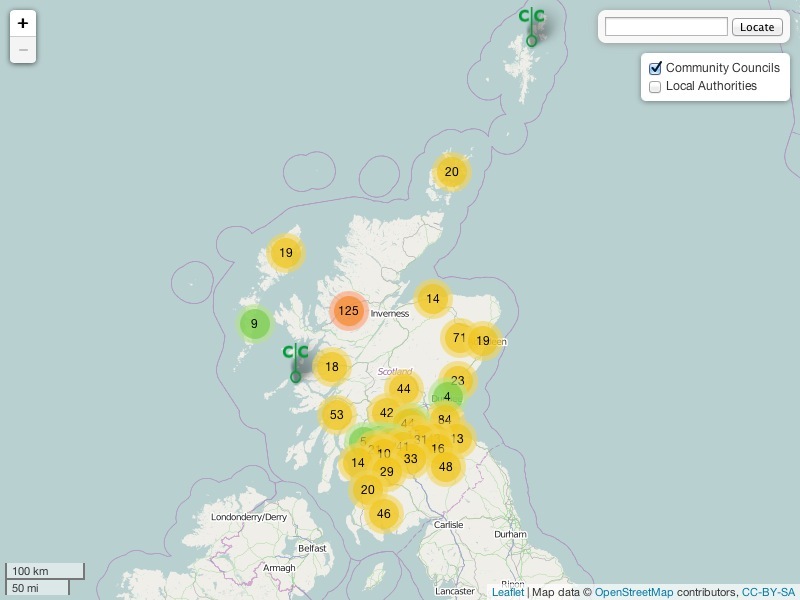 So entry to the page draws a map of Scotland, with all CCs for which we have LatLong data coalesced into lumps that show the number of CCs in each coalescence. Zooming in, or clicking on a coalescence de-coalescesces so that markers for individual CCs display. A marker is green if the CC is functional and red if it isn’t. Each marker has a popup with the name of the CC and a link to the relevant LA’s webpages about its CCs. Entering a postcode or address in the search box zooms to that place, so you can see the CCs around it. (You may need to zoom out a little.) We will draw a discrete veil over the question of how good the LatLong data I’m currently working with is – not my problem! In a copy of the file containing the data for Shetland, replace all ] ], [ [ with two <new line> in Word. Save. In the same file, replace all ], [ with <new line> in Word. Save. Get rid of dross at beginning and end of file. Save. You now have just co-ordinates, with a double <new line> between the set for each island. Find first double <new line>. Cut all co-ordinates preceding this. Save – you don’t want to risk doing this set twice. Paste the clipboard into the online batch converter, then convert. Copy the converted data into TextMate. Save. Do the first RegEx to get rid of the dross from the conversion step. Save. Do the second RegEx to replace all <new line>s with ], [, then save. Add , [ [ to the beginning of the Textmate file, and ] ] at the end. Save. Copy the whole of the TextMate file and paste it into shetland.js just before ]; (For the first set, you don’t need the initial comma.) Save. Refresh the map webpage – another island will have been highlighted. The points are very close to the LA boundaries on OpenStreetMap tiles, which is quite encouraging. 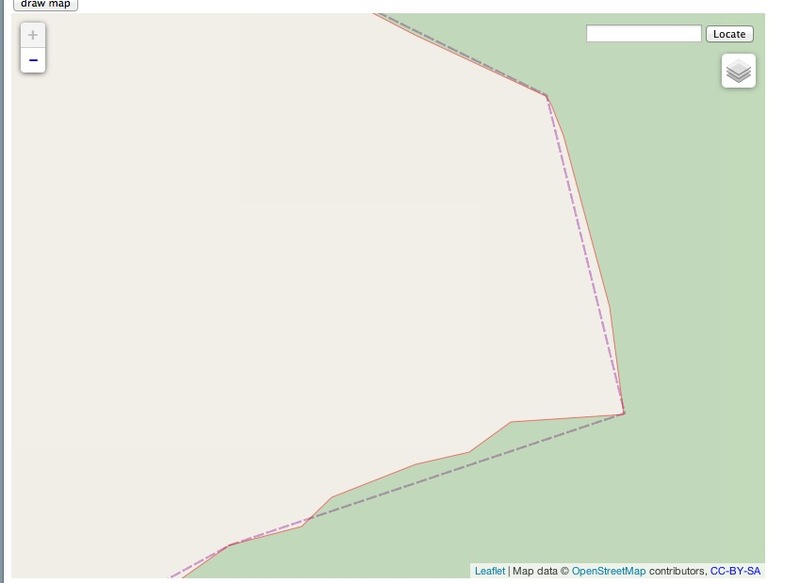 The dashed line is OpenStreetMap and the solid line is Leaflet’s rendering of the converted data. Fife is a 4-part multipolygon, that is there are four polygons in the bits that represent Fife. I guess these are the Isle of May, Inchkeith and Inchcolm. Each part of a multi polygon requires separate processing via the hero of the hour(s), http://gridreferencefinder.com/batchConvert/batchConvert.php. So I’m dreading doing Shetland, Orkney and the Western Isles. But perhaps they don’t need to be marked or coloured because they are clearly separate from the mainland. Less heroic have been Mac TextEdit (no RegEx), TextMate (one successful RegEx, then fell over and won’t stop trying to process a long finished-with Angus file) and Word (it has done most of the heavy kiting but has fallen over at least 10 times). I’ll forgive Eclipse for chugging away with RegExes very slowly but I won’t forgive it for completing the RegEx then hanging so I can’t save the result. Open the original data file in Word. Find any sub-polygons, by replacing ] ], [ [ with multiple <new line>s. Get rid of the dross at the start and end of the of the file, so that I’m left with just sets of [number,number],<new line>[number,number], …[number,number],<new line>[number,number]. When a clean data set is in the hero, it will convert the data to lines containing some unwanted blurb and the data in LatLong format. Copy that bit to a new TextEdit file called <LA-name>.js, then leave some spaces. Convert the next data set, i.e the next polygon in the multipolygon. Copy and paste that data into the TextEdit file. Repeat steps 8-12 until all polygons are in the TextEdit file. Save and close it. Open it in Eclipse. Do the RegEx to remove the unwanted blurb. (To play it safe, do a few hundred lines at a time, saving each time. Save and close the file – Eclipse is about to fall over. Open the file in Word again, then replace all multiple new lines with a suitable swearword. Save it in the right place in the website data structure, add the necessary call to index.html’s head and the necessary Leaflet call to drawMap.js. Open the web page and draw the map. Move on to the next LA!